The 3D laser litho-graphy systems developed by Nanoscribe — the spin-off can still be found on KIT’s Campus North — are used for research by KIT and scientists worldwide. Work in the area of photonics concentrates on replacing conventional electronics by optical circuits of higher performance. For this purpose, Nanoscribe systems are used to print polymer waveguides reaching data transfer rates of more than 5 terabits per second. Biosciences produce tailored scaffolds for cell growth studies among others. In materials research, functional materials of enhanced performance are developed for lightweight construction to reduce the consumption of resources. By means of the new laser lithography method, printing speed is increased by factor of about 100. This increase in speed results from the use of a galvo mirror system, a technology that is also applied in laser show devices or scanning units of CD and DVD drives. Reflecting a laser beam off the rotating galvo mirrors facilitates rapid and precise laser focus positioning. 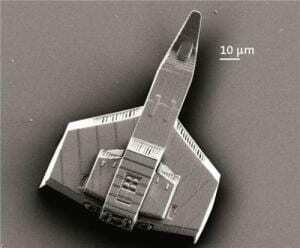 “We are revolutionizing 3D printing on the micrometer scale. Precision and speed are achieved by the industrially established galvo technology. Our product benefits from more than one decade of experience in photonics, the key technology of the 21st century,” says Martin Hermatschweiler, the managing director of Nanoscribe GmbH.